Twenty-nine seconds were all that it took for the San Diego State men’s basketball team‘s NCAA Tournament dreams to go up in smoke. Tied at 65-all, Rob Gray dribbled up the floor with 29 seconds left in the game. Gray watched as the clock ticked down, waiting to make his move. With six seconds left, Gray went in for a windmill layup that went over the rim with 1.1 seconds left. Trey Kell tried to save the day with a buzzer-beater 3-pointer, but it was off center and no good. With that No. 6-seed Houston sent 11th-seed SDSU home from the NCAA Tournament on Thursday in Wichita, Kansas in a 67-65 victory. The Aztecs were struggling in the first half, committing 10 turnovers that led to some easy basket for the Cougars. The second half, the Aztecs stopped turning the ball over and turned it into a half-court game. SDSU was 13 points down and rallied the entire second half until Devin Watson tied the game at 62 with a 3-point jumper in an assist by Malik Pope with 1:08 left in the game. Gray answered back a 3-pointer of his own for a 65-62 lead. Watson then had a turnaround trey to tie it again with 36 seconds left. Gray then burned the clock before going in for his game-winning basket. The win was the Cougars’s (27-7) first NCAA Tournament win 34 years and Gray played a big part in that. He led Houston with 39 points — the next highest scorers for the Cougars are Devin Davis and Corey Davis Jr. (no relations) with 9 points apiece. 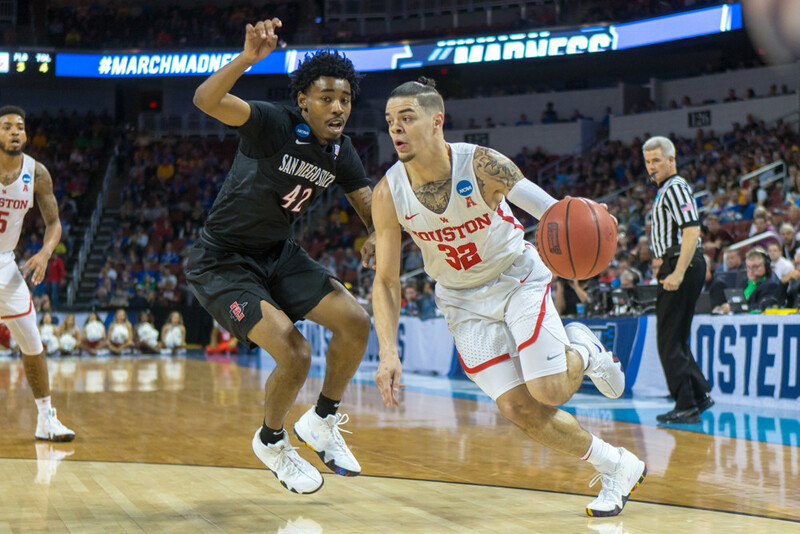 “There’s a lot of ways you have to win games, a lot of times you just have to do it from the seat of your pants,” Cougars coach Kelvin Sampson said. “The difference in the game tonight is that we had Rob Gray and they didn’t.” Sampson knows a thing or two about winning in the tournament. He’s been to the Big Dance four times with four different teams. Jalen McDaniels was the Aztecs’s (22-11) leading scorer with 18 points. Kell had 12 points and eight rebounds, but it was the missed 3-pointers that stood out. Even though a loss is a loss, Dutcher said by rallying back his team showed character even if you don’t always get rewarded for it. The Cougars will now face the winner of the Michigan-Montana in the second round.